When we were children, vacation accommodation choices were limited to inexpensive hotels (our parents weren’t wealthy!) or staying with family members on uncomfortable sofa beds with that bar that hit you right across your lower back. Today, families of all sizes have a multitude of choices, including our 2-bedroom luxury vacation rentals at Lake Tahoe. 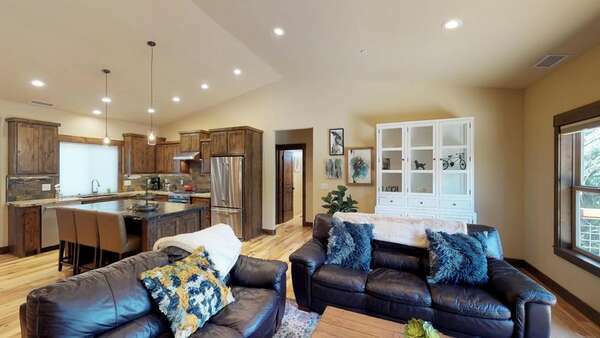 Reasonably priced and located in the heart of what makes Tahoe a popular vacation destination spot, smaller families can enjoy sharing spacious living quarters without breaking the vacation budget. Light and bright, our 2-bedroom vacation rentals at Lake Tahoe offer a warmth you can’t find in a sterile hotel room. Furnished with plush sofas and chairs that invite you to sit and stay awhile—perhaps even take a nap in the warmth of the sunlight streaming through the windows—your comfort comes first here! Fireplaces are standard in these homes, warding off the chill of the night that occurs even in the heat of the summer. Our fully equipped kitchens allow our guests to save more of their vacation dollars, offering the space for multiple chefs to create home-cooked meals easily and without stepping all over one another. The bedrooms in our luxury vacation rentals in Lake Tahoe are quiet and peaceful. Sleep comes easily here, and only good dreams are allowed! An equal number of bathrooms helps cut down on morning traffic jams—an especially important feature for those families with teenage daughters! Private patios with gas grills give mom a break. Dad will thrill to grill the catch of the day as mom sips her wine and reads that book she has had on her nightstand for months! Some of our 2-bedroom rental units have views of the lake, some have views of the golf course, and all our luxury vacation rentals in Lake Tahoe have stunning views of the scenic natural beauty of our favorite mountain town. There’s always something to do in Tahoe, and if you’re visiting during the summer months, adventure outside of our vacation rentals at Lake Tahoe and visit to Vikingsholm! This 38-room mansion was built in 1929 and offers a stunning glimpse into the lives of the early American aristocrats, with tours being offered from Memorial Day through late September. Perhaps one of the more interesting facts about this beautiful Scandinavian style mansion is that the original owners were the main financial backers of Charles Lindbergh’s cross-Atlantic flight in the Spirit of St. Louis. Sometimes a vacation isn’t as much about lying somewhere on the beach doing nothing all day as actually immersing yourself into something that is different from your daily routine. And that’s how you become more relaxed. Take art for example. Learning a new hobby that will wake the inner artist in you and get your creative juices flowing is one of the most enjoyable activities you can do during your vacation. Luckily for you, North Lake Tahoe has many art centers that can help you out. From North Tahoe Art Center to Painted Rock Pottery and Mosaic, there’s a lot you can learn and get your hands dirty with color. Since we’re talking about activities in Lake Tahoe, the first thing that comes to mind is fishing. But in fact, the lake is not the only angler’s destination around here. Many rivers, streams, and creeks offer an ample opportunity for the patient angler to catch their dream fish. And all kinds of fishing styles are available. Whether you like shore fishing because you don’t like to get your feet wet or you prefer fishing charters that take you deep into the lake where the good fish always swim in schools, you can always find a way to enjoy your hobby around North Lake Tahoe. Just remember that you’ll need a fishing license from the authorities. Ice skating is one of the most popular winter sports around here. It’s not as demanding as skiing and you’re not exposed to the elements in the same way as downhill skiing. Instead, you put on those cute skates and off you go around the rink. People fall, laugh, then get up only to fall again. But nobody gets injured and the children squeal with excitement. This makes it the perfect outing for the whole family. Skating rinks around here vary in size and amenities from Olympic rinks to private ones. Each has its advantages, so check which one suits you before booking. Being so close to the lake, the fresh mountain air, and the clear blue skies just makes you feel invigorated, which is a good sign you could use the services of a health spa—and there are plenty of those around, such as beauty salons that will make you forget about the stress of your demanding job and pamper you for a change. After all, what’s a vacation if you can’t enjoy a good massage or a pedicure? The experience will have you returning to one of our luxury vacation rentals in Lake Tahoe feeling refreshed and relaxed. It’s never too soon to start planning your once in a lifetime family vacation to beautiful Lake Tahoe. Reserve your Tahoe Signature Properties 2-bedroom condo and make you vacation dreams come true!